RARE WWII ACE’S FLIGHT LOG BOOK – 15TH USAAF, 52ND FIGHTER GROUP, 5TH FIGHTER SQUADRON P-51 PILOT – LOG ENTRIES INCLUDE NOTATIONS ON ALL FIVE AIR VICTORIES: A rare offering, this is the Pilot’s Log Book of LTC (ret) James W. Empey, a career US Air Force pilot and most notably, a documented World War Two Fighter Ace who secured his five air victories while flying his P-51 over the skies of southern and eastern Europe in 1944. In December 1943, Lieutenant Empey shipped out for North Africa, reporting to the 5TH Fighter Squadron, 52ND Fighter Group, 15TH US Air Force. Empey began his war flying U.S. Army Spitfires and it wasn’t until after the squadron was moved to Corsica that they received the P-51 Mustangs in March of 1944. Empey’s pride in being issued his own P-51 is noted in his log, "GOT MY OWN SHIP - No. U. (Hot damm!). During the course of Empey’s service in Europe, his flights included escorting flights of B-24’s and B-26’s on bombing missions to Poland, the famed Ploesti Oil Fields, and over the German homeland. 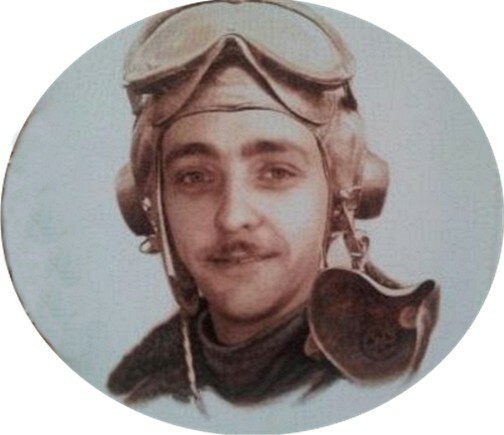 Empey attained his “Ace” status on July 28TH with the destruction of a Me-109 south west of Bucharest, Hungry. Empey returned to the United States and after the war he was discharged to return home to his native New York. Before long, he rejoined the service, and made the transition to the US Air Force when it was created in 1947, serving 30 years before his retirement in 1972 at the rank of Lieutenant Colonel. In addition to his combat flight time in Europe, he also flew a considerable number of combat missions in Vietnam. Empey logged an impressive flight career including time in the P-39, P-40, the Spitfire, P-51, F-84, F-86, F-100, F-101, F-102, F-104, B-17, B-25, C-47, C-123, L-20, T-28, T-33, O1-A (L-19) and notably in a JU-52. He logged a total of 5,437 hours of military flight time, including a total of 1,327 hours of combat time. On a personal note, Empey eventually retired in San Antonio, Texas and it was here that I met and got to know him as Jim. Despite his advancing years and the toll an active life had taken on his body, Jim was as pleasant a man to be around as you would hope for - quick with a laugh, even quicker for one of the jokes he was known for, and never at a loss for a good story. There are two notable stories of his that poignantly framed his career that I still treasure – the first occurred as a young “hot shot” pilot in Italy being dressed down by his plane captain after returning from a mission and having melted the barrels of the machine guns on his plane, and the second of a chilling episode over the skies of Vietnam while flying an O1-A in support of an American army regiment engaged in a desperate battle below. Both are a bit long to relate here, but will be shared with the eventual owner of this grouping. In addition to the impressive collection of flight helmets and the related equipment from not only the United States air forces, but from the air forces of nations around the world, Jim was also a very discriminating and well informed collector of 19th Century Colt Firearms, M-1 Carbines, and 20th Century military pistols. He was one of those rare gentleman collectors that we are fortunate to meet on occasion, and whether you were buying or not, you were always welcome at his show tables or in his den. After Jim passed away in 2013, I had the opportunity to obtain a number of items from his collection and some of the pieces related to his service, in particular to his early aviation days in Europe. Of special note, I was able to purchase his Pilots Log Book, in which he recorded his flights from his early days at flight school in 1942 through March of 1988 when he apparently stopped piloting. Of special note are the entries which include notations of his five air victories. * A print of Thomas A. Tullis’s “North American P-51B Mustang, 1st. Lt. James W. Empey, 5th F.S., 52nd F.G., 15th A.F.” depicting Empey’s P-51, Little Ambassador as it appeared during his service in Italy, 1944. The print measures 17” x 11” and is autographed by Empey. * A limited edition, numbered print of “The Little Ambassador Speaks”, executed as part of the series commissioned by the American Fighter Aces Association to document in art one notable air victory for as many of the surviving World War Two American Air Aces as possible. The numbered print, bearing the original signatures of both the artist and Empey, depicts the aerial combat that resulted in Empey’s fourth air victory. * Empey’s USAAF Officer’s Service or Garrison Cap, dress khaki with the bullion cord trim and bearing his lieutenant colonel’s insignia.